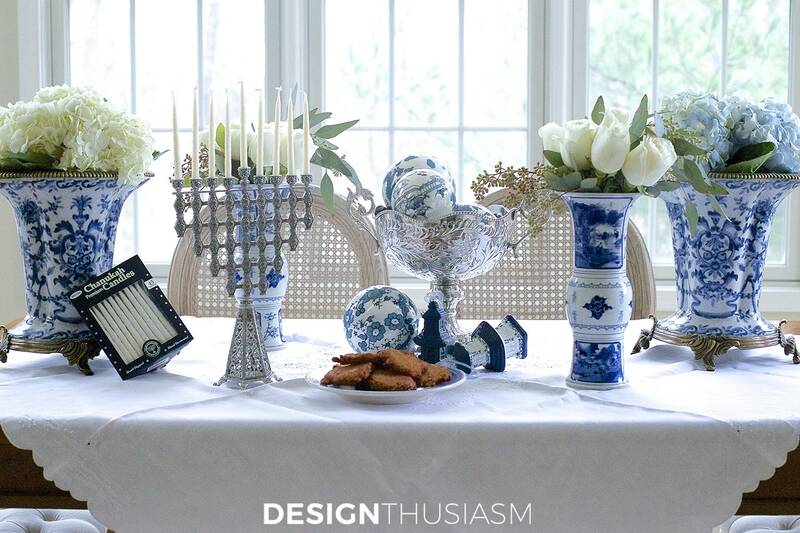 Using blue and white chinoiserie for Hanukkah decorations is my secret weapon! Well, not like an actual weapon but more like a stunning secret to crack a decorating code. When I was younger, it always disappointed me that there was no inspiration in magazines or shops for Hanukkah decorating. December offered the most stunning Christmas displays in rich red velvets and mossy greens, lush gold and silver, and every possible shimmery, glimmery and sparkly option one could imagine. But none of them were for Hanukkah. 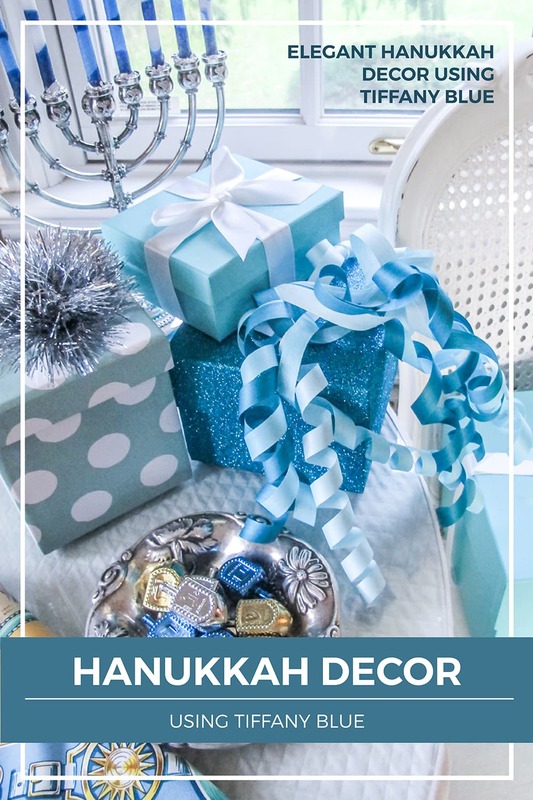 Hanukkah was always relegated to a small section at the end of the aisle with garish wrapping paper, tacky gold wrapped chocolates and plastic party goods. This was never going to work for my French Country sensibility. And then one year I noticed a lovely spread in Martha Stewart Living of a beautiful table set for Hanukkah entertaining. This rocked my world! 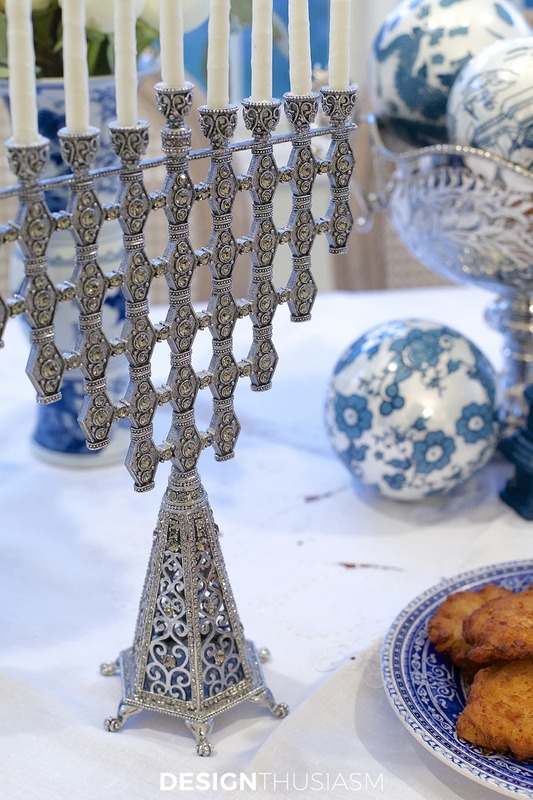 Yes, there was no reason Hanukkah couldn’t be approached with the same panache and design flair as any other holiday. And, all the better, the traditional Hanukkah colors were blue and white. This was going to be easy! 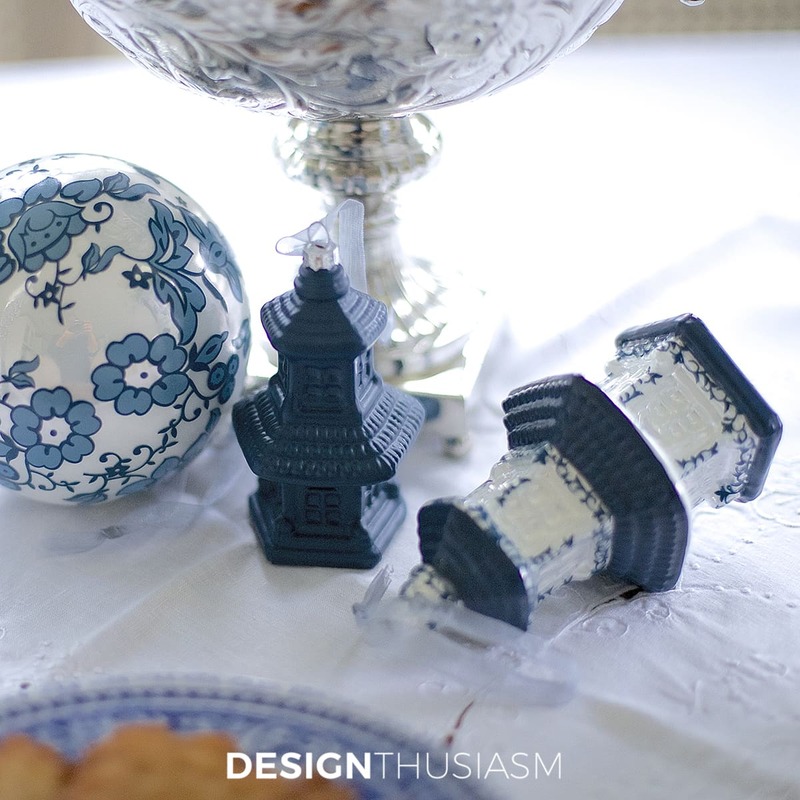 Blue and white chinoiserie ornaments – what is an ornament if not a simple orb meant to add color and pattern to your holiday decor? 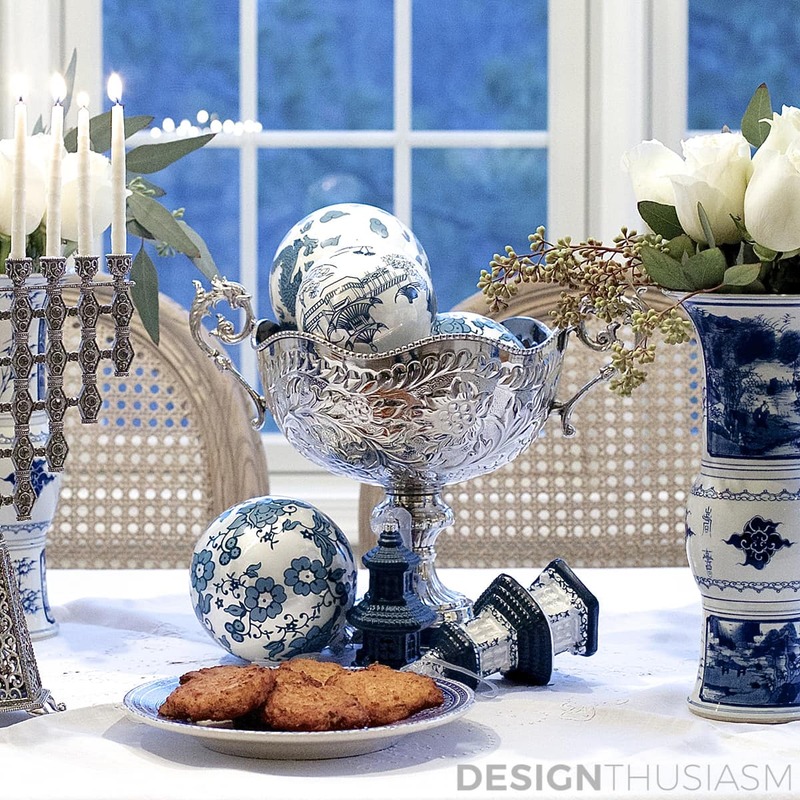 These gorgeous chinoiserie ornaments are the quintessence of French Country style and they also happen to work perfectly with the traditional Hanukkah colors. 2. White flowers – I used hydrangeas and white roses, but any pretty white flowers will give you the same look. A cluster of white flowers has a purity and simplicity that exudes elegance. Throw in some drapey greens and you’ve sealed the deal. 3. White embroidered tablecloth – I’m a huge fan of vintage linen with tonal white embroidery. 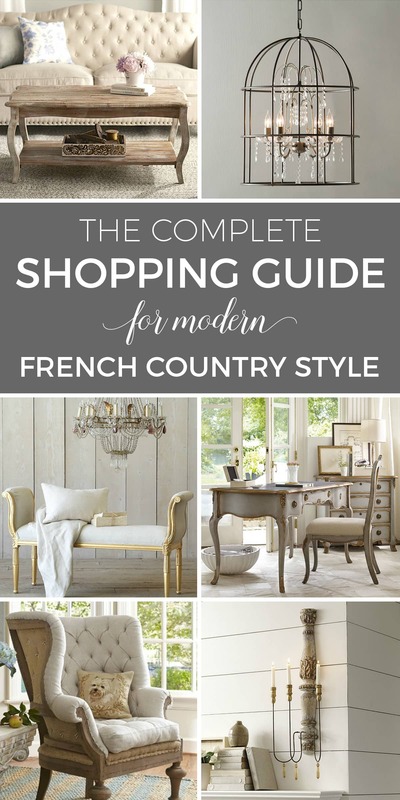 It can be used for so many different looks from casual farmhouse to the most formal dinner parties. 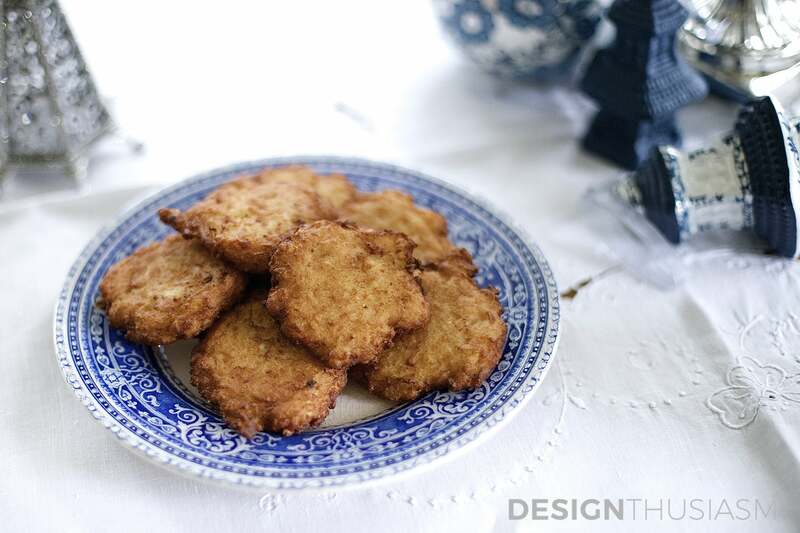 Here it provides a sweet backdrop for a plate of potato latkes, a traditional dish served for Hanukkah. 4. Silver objects – silver looks stunning with blue and white, and the more elegant the objects, the more impactful the effect. There’s plenty of shimmer and bling to be had on this table, from the jewel encrusted menorah to the silver footed fruit bowl. I like to stick with white candles to maintain the classic look. 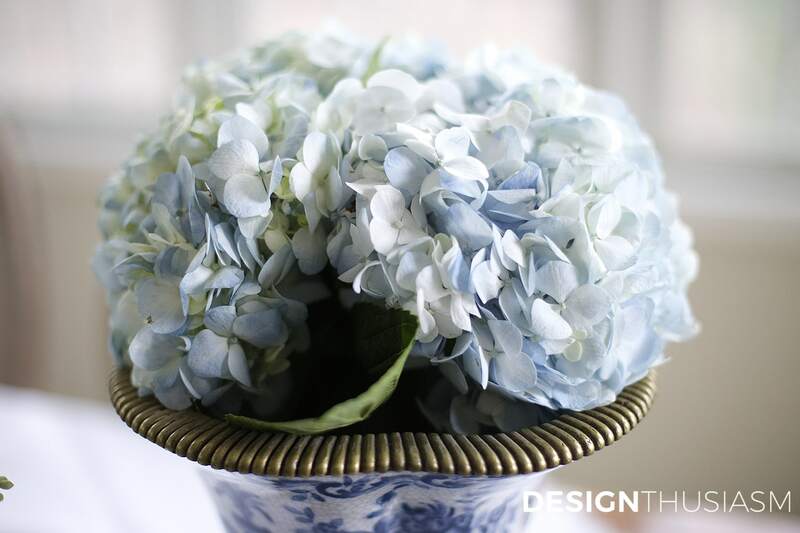 If you can find the right tones, blue flowers work well, too. 5. 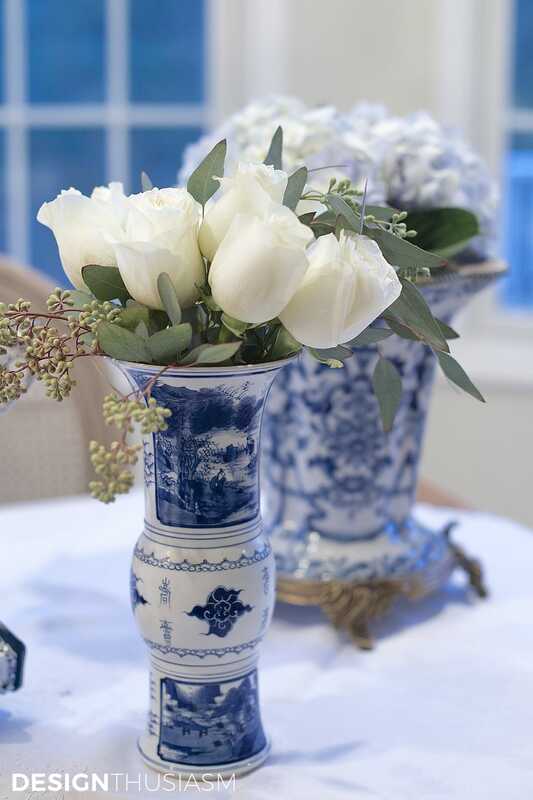 Chinoiserie vases – If, like me, you collect these blue and white beauties, this should be a no-brainer. I had actually intended this vignette for my kitchen island (or a sideboard would be perfect as well), to function as a styled display for my menorah and latkes. But the day I did my photo shoot was dreary and grey with buckets of rain pouring down for the entire day, so I moved the whole vignette to the table to be closer to the window. If you’d like to find some similar chinoiserie vases you can look HERE and HERE. You can find the silver menorah HERE. I’m delighted to be joining a group of talented bloggers today for the bHome for the Holidays blog tour. You can find links at the bottom of this post to all of the other tours and I invite you to visit them and enjoy their holiday best. Beautiful, Lory. This would be pretty for any season or holiday. 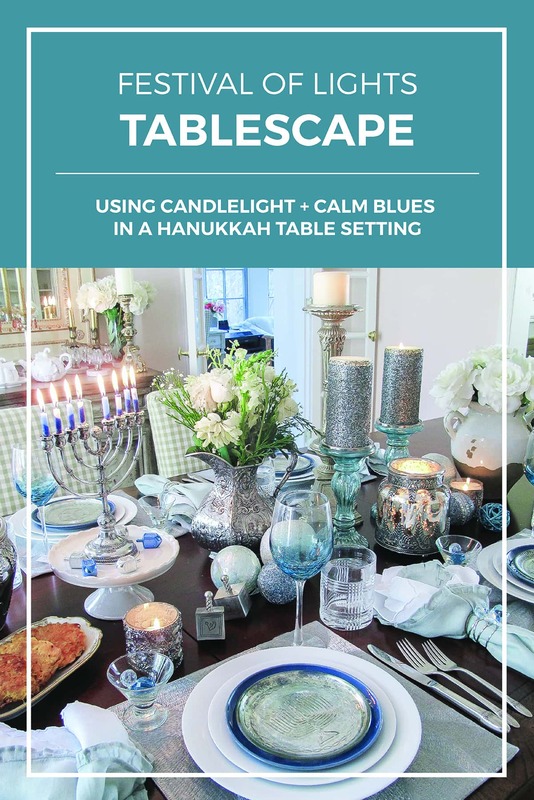 I did a blue and white table much like this years ago just not with the menorah. 🙂 That is a beauty though. How so very beautiful Lory. 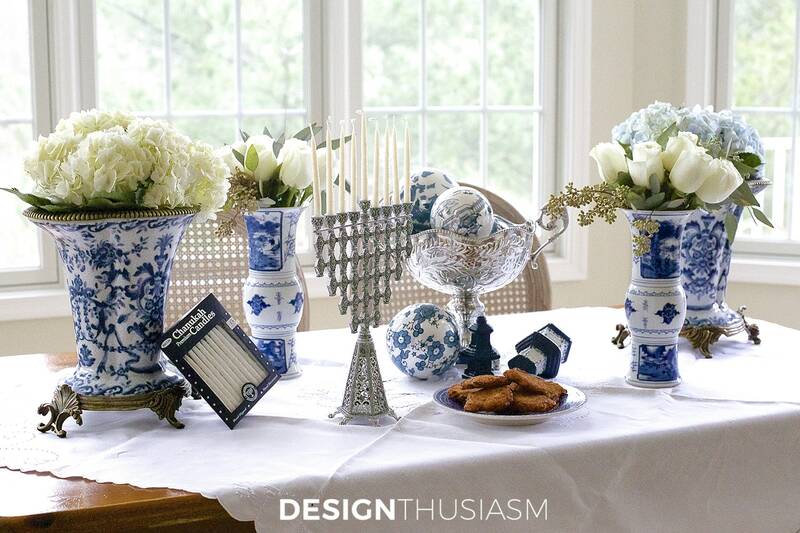 Love how you used the blue and white Chinoiserie decor for your table decorated for Hanukkah. 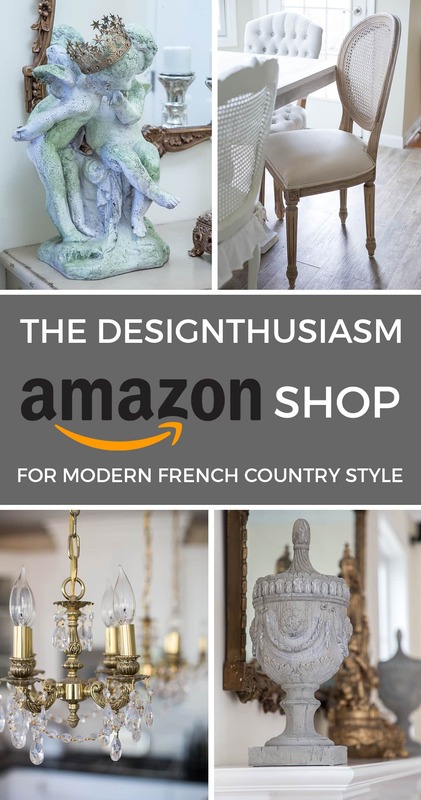 I have seen many Hanukkah Menorahs and your silver one is exquisite!…Your rainy day situation turned out to be great as the vignette looks wonderful in your breakfast room! 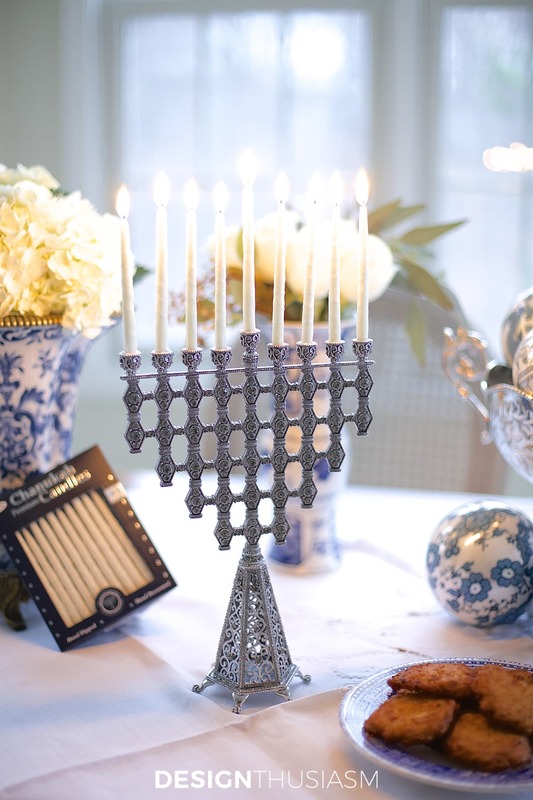 You created a most exquisite Hanukkah vignette that even Martha Stewart would be in awe of!!! Thank you so much, Shirley! I know we’ve all been through that situation with a rainy week and photo shoots to get done, so we need to improvise. I so appreciate your kind words!! Nothing plastic, gaudy, or tacky about your Hanukkah decorations. Everything is gorgeous and elegant. I agree with Miss Shirley…Martha Stewart would be in awe of how you pulled this all together! Lol…. thanks so much, Donna!! This is so elegant and beautiful, Lory. I am so happy that you shared such a gorgeous wany to decorate for Hanukkah, there isn’t much inspiration out there. 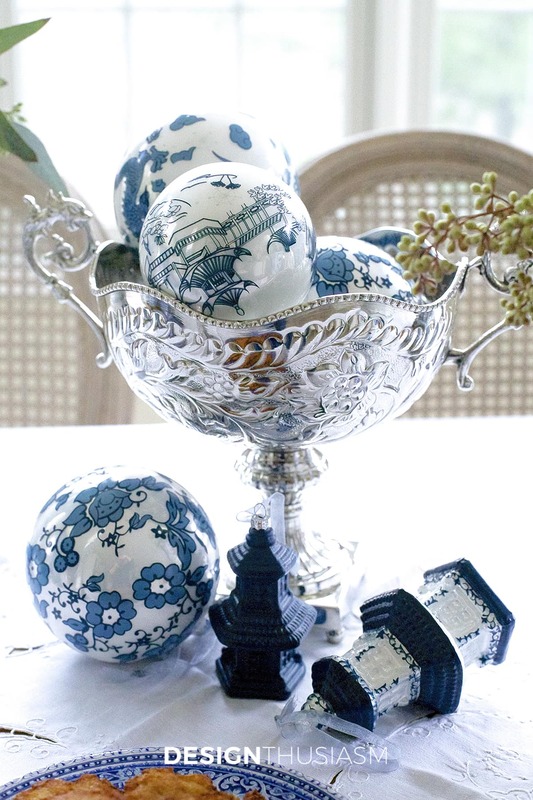 The blue and white, silver and chinoiserie patterns are just about perfect! That menorah is superb, who wouldn’t want to light the candles in that? Even Martha couldn’t make this more special, this is the perfect holiday table for a meaningful holiday, Lory. Haha Lidy, maybe I should contact Martha… 😉 But seriously, thank you so much for your kind words and for all you did to help put this tour together!! It was a great one that I was so grateful to be part of. Lory – I have so many friends that celebrate Hanukkah and they would love your tips. You rock the Hanukkah decor. I will be passing this post around. Really lovely! And what a stunning menorah! Happy Hanukkah to you & yours!! Thanks so much, Kelly! I really enjoyed being part of this tour and can’t thank you enough for including me… 🙂 I finally got a chance to make the rounds today and everyone really outdid themselves!! Wow, you are an inspiration!!!!! Just found your blog, but I’ll be a follower now. Getting in the Hanukkah mood…. Welcome, Devra! So glad you’ll be following… 🙂 I’ve got some older Hanukkah posts you may enjoy as well (although the next few days will be Christmas). I’ll also be doing a Hanukkah guest post on a friend’s blog as the holiday gets closer, so will link to that one here too. 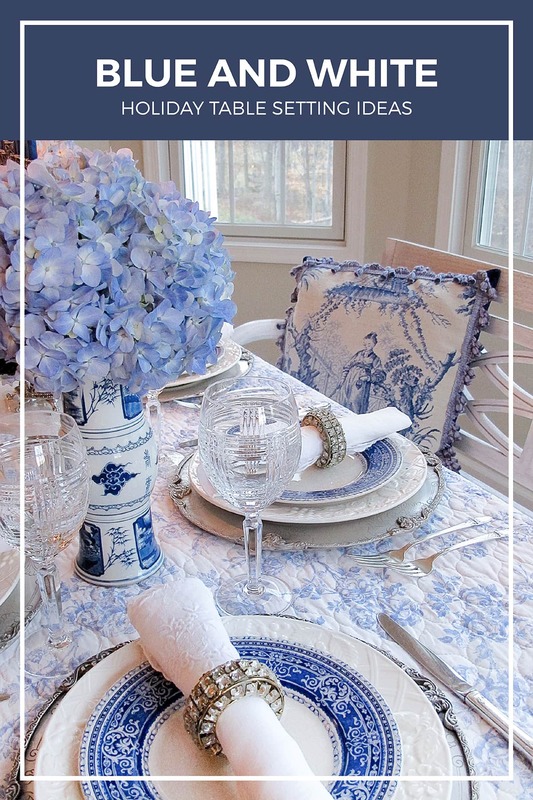 This is one of my favorites from last year: https://designthusiasm.com/french-blue-and-white-holiday-table-setting/ Enjoy!! 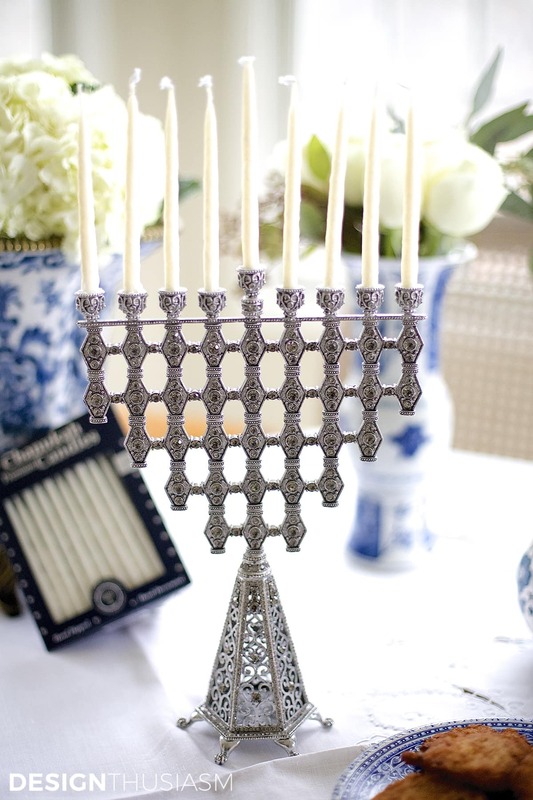 Your Hanukkah Menorah is absolutely gorgeous! I’ve never seen one so pretty! I love your collection of blue and white Chinoiserie . You created the perfect setting! Beautiful Lory! Looks like a magazine. Very elegant and eye catching. it is all so beautiful. i have never seen a menorah like that. stunning. I am completely blown away. This is the most beautiful Hanukkah layout I have ever seen! This should be in a magazine! Aw, thank you so much, Sarah! What a lovely thing to say!! Lory, I’m sure everyone has already covered what I wanted to say, so I’ll just add that I’m glad you stayed true to your own style and used what sang to your heart. 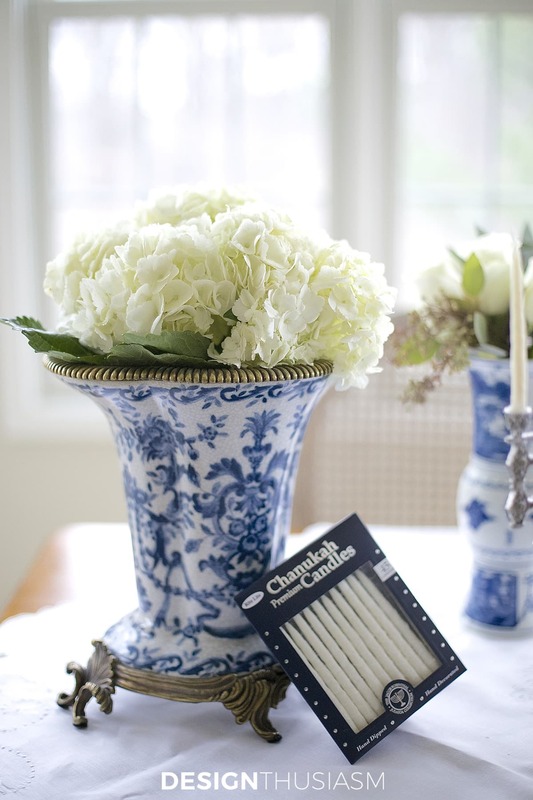 The blue and white chinoiserie is gorgeous and this colour scheme always has timeless appeal. I just found you blog via Pinterest and all I can say I am so happy about it! Such an inspiration! Beautiful pics! You got me right on Holiday track – – – I’ve been feeling a little bit *blah* with Hanukah and now I can’t wait the 2 weeks to go by quickly enough! Thank you so much! And your Menorah is absolutely the most beautiful I’ve ever seen! Miriam, thank you so much for your comment!! It’s comments like these that keep me on track when I feel like blogging is just too much work. My goal is to inspire and it’s a pleasure to know when that’s working… 🙂 Welcome and enjoy! !